Berry, Grant M and Ernestus, Mirjam 2018. Phonetic alignment in English as a lingua franca: Coming together while splitting apart. Second Language Research, Vol. 34, Issue. 3, p. 343. Strycharczuk, Patrycja and Sebregts, Koen 2018. Articulatory dynamics of (de)gemination in Dutch. Journal of Phonetics, Vol. 68, Issue. , p. 138. Uloza, Virgilijus Petrauskas, Tadas Padervinskis, Evaldas Ulozaitė, Nora Barsties, Ben and Maryn, Youri 2017. Validation of the Acoustic Voice Quality Index in the Lithuanian Language. Journal of Voice, Vol. 31, Issue. 2, p. 257.e1. Sadakata, Makiko and Sekiyama, Kaoru 2011. Enhanced perception of various linguistic features by musicians: A cross-linguistic study. Acta Psychologica, Vol. 138, Issue. 1, p. 1. Chládková, Kateřina and Jonáš Podlipský, Václav 2011. 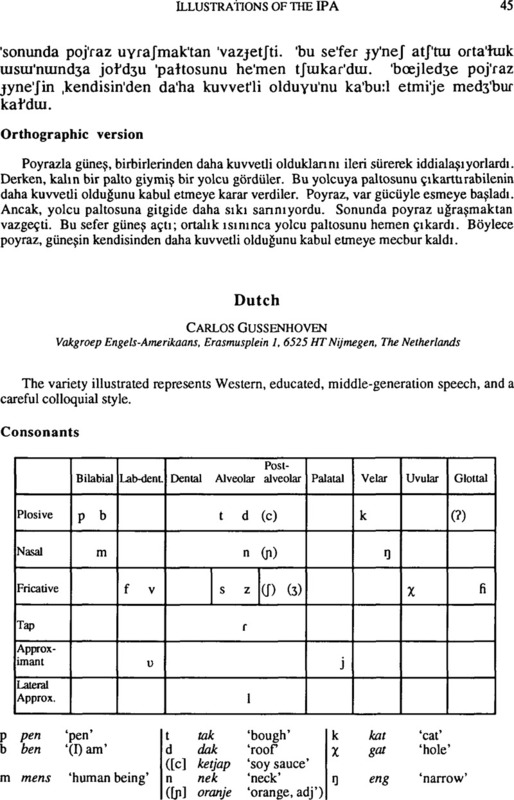 Native dialect matters: Perceptual assimilation of Dutch vowels by Czech listeners. The Journal of the Acoustical Society of America, Vol. 130, Issue. 4, p. EL186. Warner, Natasha Smits, Roel McQueen, James M. and Cutler, Anne 2005. Phonological and statistical effects on timing of speech perception: Insights from a database of Dutch diphone perception. Speech Communication, Vol. 46, Issue. 1, p. 53. Weber, Andrea 2001. Help or Hindrance: How Violation of Different Assimilation Rules Affects Spoken-Language Processing. Language and Speech, Vol. 44, Issue. 1, p. 95.
van de Velde, Hans Gerritsen, Marinel and van Hout, Roeland 1996. The devoicing of fricatives in Standard Dutch: A real-time study based on radio recordings. Language Variation and Change, Vol. 8, Issue. 02, p. 149.